Emotions are on display everywhere around us. We see different people react in varied ways to emotional situations. Classic literature, acts of bravery and inspiration and even wars are all a result of emotions. Today, social media exposes us to a large number of people who are emoting all the time. There are those who express emotions of deep anxiety when being bullied and those who provoke people to act based on a heightened emotional state. People who show great emotional restraint in the face of adversity are worth emulating and learning from. How does one nurture this kind of emotional control? Surely, the foundations for this are built while one is growing up – with the help and guidance of communities, schools and families. 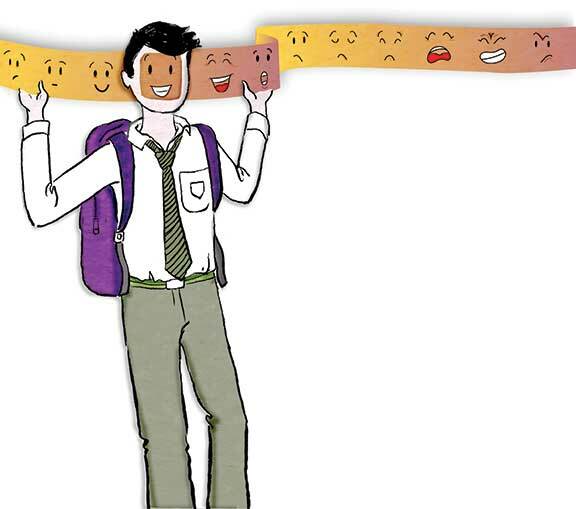 We spoke to Mrs Asha Narayanan, the Principal of Lodha World School in Thane to understand what schools and communities could do to nurture children’s emotions in a way that enables them to emote suitably as adults. Several situations and conditions around us can harm a child’s emotional health. According to Mrs Narayanan, parents who have little time to spend with their children doing meaningful activities, bullying in schools or on social media, isolation and over indulgence in activities that take away fruitful family time, can affect a child’s emotional development deeply. Emotions play a crucial role in the life of human beings. Evolutionary psychological research purports that emotions helped our ancestors save themselves from looming danger from predators. Anxiety, for example, would disallow pre-historical man to fall asleep, thus ensuring safety of the entire group. Hence, emotions play an important role of safeguarding us. Despite emotions being lifesaving and integral to survival itself, children are asked to think rationally than emotionally. Children can rarely explain their emotions. (For that matter nor can adults!) However, when children’s emotions are questioned or doubted, they find it hard to explain, and this might lead them to relegate emotions to a secondary position. An environment that aims to develop emotionally healthy children will enable an exploration of emotions and not an explanation for them. When children are not trusted and their feelings are questioned, it creates in them a deep aversion to expressing their emotions. Gaslighting is, for example, a phenomenon where one’s perception of objective reality or their beliefs is questioned to an extent that the person begins to doubt their way of thinking. Gaslighting is rampant in terms of emotions that children or people experience and can be even more dangerous as emotions are after all subjective. Negating someone’s emotions as a response to a situation can make the child lose faith in his/her emotions. “Why would you be sad about it?” is a common response to a child who is rightfully sad about something. This is often said even by a well-intentioned teacher, and can in fact lead the child to be confused about the emotion they are experiencing. Adults while wanting to help the child see the situation differently might inadvertently lead them to mistrust their emotions and eventually mask what they really feel. Mrs. Asha Narayanan states that, increasing awareness among teachers of children’s emotional health can help them react appropriately to students’ emotions. It is necessary to validate a child’s emotions towards a situation and acknowledge how a child feels as a step towards creating an emotionally safe environment. Often, adults help children deal with a highly emotional, or generally a sad situation, by distracting them. Children are sometimes taken out for ice-cream treats, shopping sprees or even movie and amusement park trips to help them divert their thoughts from something that can be emotionally draining. However, teachers and parents need to understand that a child needs to process the situation and the resulting emotions to attain closure. At such times, it is beneficial if teachers or parents have a conversation with the child and affirm what the child is feeling and provide an emotional balm to the child instead. Empathizing with the child and also sharing similar situations with them can help build a child’s emotional tenacity. Being a role model for the child in terms of displaying emotions can help the child understand that it is normal to shed a tear, laugh at a joke or even show fear and anxiety. Role modelling can help create an environment where the child feels emotionally safe. Often, teachers show authentic emotions in the classroom. They might be angry at an outcome in the class or even joyful. Mrs Asha Narayanan believes that conveying feelings through words is better than a teacher simply responding in a negative tone. A teacher is encouraged to speak calmly to the children about what has transpired and triggered a certain emotion. Today, one of the most pertinent conversations we are having is around gender differences in the way men and women emote. In Mrs Asha Narayanan’s school, teachers are sensitized to these realities and are encouraged to see both the genders as being equal. She leads by example with the way she has raised her own children and believes that although society has a long way to go in providing an emotionally safe environment for both girls and boys, we have made a start. In an environment that might prove harmful, boys are often taught to be tough and to mask or suppress their emotions while girls are encouraged to display their feelings. Hence, boys are asked not to cry while girls are instructed to ‘smile a little more’. These starkly opposing messages have fostered a society where males cannot cry in circumstances as grim as the death of a loved one while women battle comments on their lack of feelings. Both boys and girls need to know that there are different emotions and none of them is more preferable than the other. All emotions have positive or negative outcomes and what is required is a thoughtful expression of both, by boys and girls. Mrs Asha Narayanan states that it is imperative that we know about our internal wellbeing before we engage with children. Mindfulness, according to Mrs Narayanan, is what supports a teacher and school to create a climate that nurtures emotions in a child. Recent research has suggested that the ability to empathize is a sign of high intelligence. Only when children have experienced and studied their emotions and have felt heard, understood and appreciated, will they be able to offer the same to others. As Mrs. Asha Narayanan says, we need to change from ‘reacting’ to ‘responding’ when children express their emotions so that they learn to do the same with others. The author works at Mantra For Change, a social enterprise that aims to transform schools in Bangalore. She has been an education consultant for close to five years and has been writing, albeit privately, for a decade. She can be reached at fiona.vaz@gmail.com.